In our last post on interest rate risk, we looked at how to use the Interest Rate Stress Test in Riskalyze to help us win a new client. Today, let’s take a look at drilling into the portfolio to find out where all of that interest rate risk is really coming from. Here’s the portfolio we were analyzing, modeling a +100bps rise in the 10-year US Treasury rate. Because of tax considerations, I may not be able to sell everything that is driving the increased risk in this portfolio. So how do I know what to sell first? I turn on the Risk / Reward Heatmap, and that quickly shows me where the risk is really coming from. Instead of starting with the biggest holdings (BND and BIV), it’s clear that I’d want to start by selling EDV and BLV first to reduce risk the most. The heatmap is also great for testing different replacements to build a better target portfolio for this prospective client. 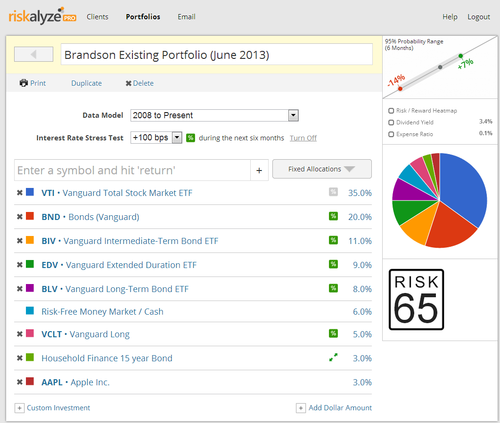 I click “Duplicate” and rename the new portfolio “Brandson Target.” Then I can test my favorite fund ideas and show the prospective client how these funds will reduce their risk. Of course, you can also do this with existing clients. 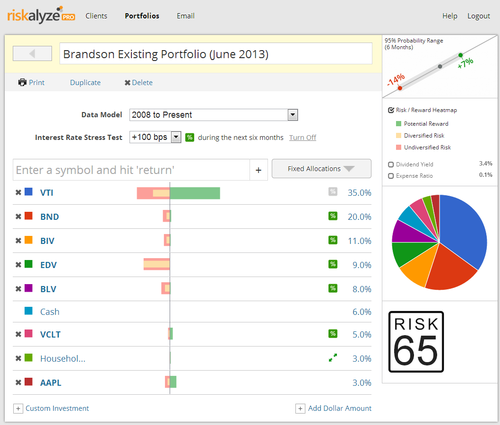 Use the drag-and-drop portfolio integration to easily import the client’s existing holdings into Riskalyze. 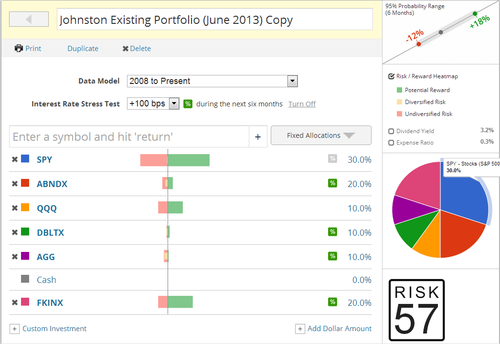 Then click duplicate and start building a new target portfolio. 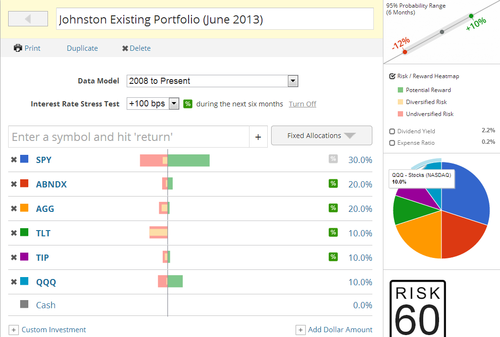 Here’s an example of an existing portfolio with a risk number of 60, and a six month probability range of –12% to +10%. I duplicated it and started building a new target to propose to the client. I sold out of TIP and TLT, and added FKINX. That drove the risk number down to 57. The probability range has about the same downside risk of –12% but substantially more upside at +18%. Here’s another potential solution for this client, depending on their risk tolerance. I added PDMYX and JSOSX instead of FKINX. That dropped the risk number to 52, with a probability range of –10% to +13%. I also test each of my model portfolios periodically, just to see how much interest rate risk they are exhibiting. The combination of the interest rate stress test, and the risk/reward heatmap make it simple to test different ideas and truly be a “Risk Aware Advisor” for my clients.